With the help of LRTimelapse screen in qDslrDashboard you can monitor your time-lapse session and eventually make some changes to camera exposure settings if needed. It was made with help of Gunther Wegner the developer of the LRTimelapse application. By monitoring the histogram when shooting Sunsets/Sunrises and changing Exposure/ISO accordingly from time to time as it gets darker or brighter you will be able to capture time lapses with a huge dynamic range without the need to use HDR, bulp ramping or other complicated and inferior techniques. DSLR Dashboard helps you to make all those adjustments without touching the camera and lets you do all you need to via this one, streamlined screen. You will then use the Software LRTimelapse to easily compensate for that adjustments by intelligently tweaking the Metadata of the images and using Lightroom or Adobe Camera RAW and LRTimelapse to render a smooth time lapse transition from day to night without any visible jumps. Please find all information about LRTimelapse and the so called “Holy Grail Method” of time lapse shooting including video tutorials and a free test version on LRTimelapse. Display next JPG – with the help of this button the user can instruct the application to download/display/analyse the JPG image from camera after a capture is made. If the ‘display next JPG’ option is enabled the button will have a red color. Correction frame count – with this button the user can select how often will the application download and analyse the captured JPG. 1 frame means the application will download and analyse every JPG after capture, 5 frame means that 5 captures must past before the application downloads and analyses the JPG after the capture. Region selection – with this button the user can select a region of the captured image that will be used for ‘average’ value calculation. reference point – this is the value that the ‘auto holy grail’ uses to determine if it needs to change the shutter speed or ISO. When used with ‘sunset’ option (3) if the ‘calculated average’ is smaller then the ‘reference point’ the application will try to change the shutter speed/ISO until the ‘calculated average’ is greater then the ‘reference point’ or the ‘Slowest shutter speed’ (7) or ‘Max ISO’ is reached. Image display area – this is where the downloaded JPG image is downloaded. 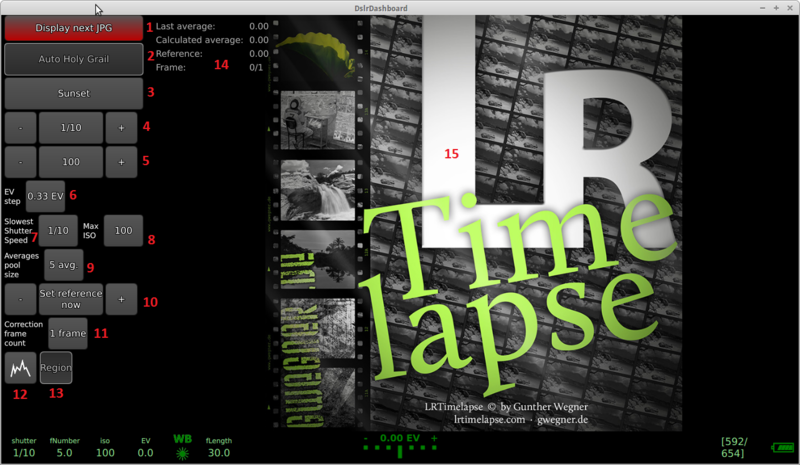 The user enters the LrTimelapse screen (prerequisites are that the camera is in M mode, the EV step and ISO EV step are same, the image format is set to any of the RAW+JPG format). If not enabled the user enables the ‘display next JPG’ option and makes a capture with the camera capture button or the connected intervalometer capture button. After capture the application will download, display and analyze the JPG image. It will calculate the ‘average’ value from histogram and set the ‘reference point’ according the calculated ‘average’ value. The user selects the desired ‘auto holy grail’ direction (sunset, sunrise), selects the ‘slowest shutter speed’ and ‘Max ISO’ values. The user also selects the desired ‘average pool size’ value and the ‘correction frame count’ options. If needed the user changes the ‘reference point’ value with the -/+ buttons. After all the options are set the users enables the ‘auto holy grail’ by pressing on the ‘auto holy grail’ button and finally the users starts the intervalometer.